There are currently 22 online users. I would like to welcome you to the new Theme. The reason I had to take the forum down was to upgrade the forum software. please let me know in a reply to this post. work with the new theme. Therefore we have a new shoutbox, although somewhat limited. I may look into a newer one in the future, but for now that's what we have. To combat the latest threads in the chat, they are now down the right-hand side. To top it all off. This theme is Mobile friendly, so feel free to find bugs/enhancements on your phone/tablet. Thank you in advance, and sorry for the downtime. 1: we can now recall an avatar when it's lost or if someone has logged out with it. 2: Everyone is able to see if there's an avatar out, the world, buff and who has summoned it. The clan noticeboard now displays the name and world of clan Avatar Wardens. Clan/Friend chat icons have been updated. 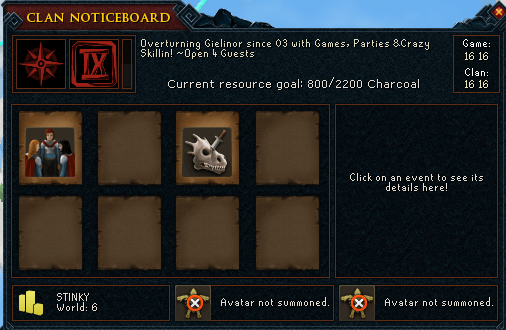 Keywords and noticeboard drop downs have been updated with such useful words as Prifddinas, Cabbage Facepunch and others. Updated the clan founding interface to NIS standards. Updated the clan invite interface to the NIS standard. 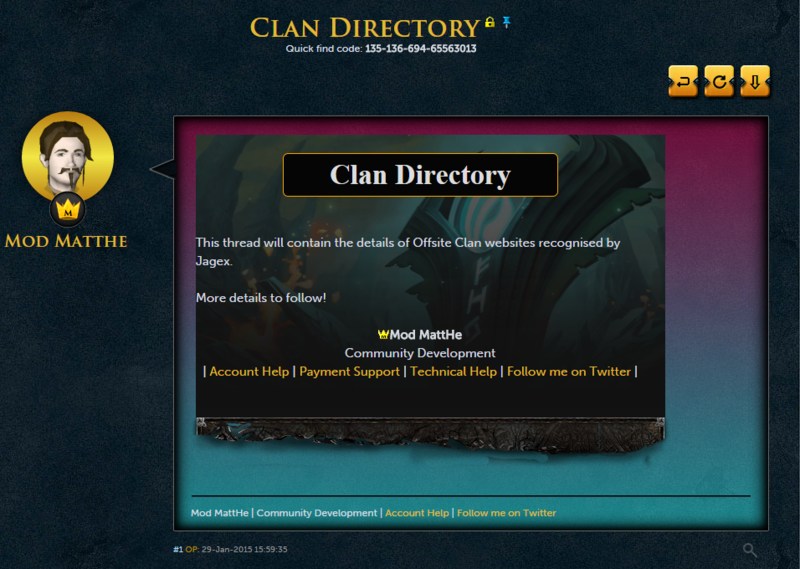 Added the clan motto, home world, clan size and relevant page links to the clan invite interface. Clan vexillums placed in the stands at the Clan Camp and Burthorpe will persist for 30 minutes unattended to advertise your clan while you play elsewhere. The large clan flag in Burthorpe now cycles through the colours of the clans represented on the surrounding vexillum stands. You can see an overview of the clans represented by checking this flag. A runestone has been added to the Avatar habitat that allows clan members with correct permissions to recall avatars back to citadel. Wherever the avatar is it will be de-summoned and will immediately return to the citadel. 2. Applying on the recruitment thread is now optional. 3. Faster invites after a few hours (max 24). 4. Lieutenants+ able to invite new members. 5. Admins+ will keep a close eye on the new ones - complaints regarding them will be dealt with asap. This means quick warnings and or kicks if anyone causes trouble. (only overseers+ will kick). *People should still read our recruitment thread - they should know a bit about the clan before joining. If you have any questions or suggestions then please post them below. Runelab Clan Suggestions - Please vote! We have been talking about this on the clan leaders forum and we figured hey why not take over runelabs to get some clan updates done? So we had a big discussion and voted on suggestions we want to get added. Now these runelabsuggestions are the result of that vote. So please support these suggestions on runelabs so our clan life gets even better! You may or may not have noticed that many peoples accounts have been corrupted lately. I'm not sure how but it seems most of them don't even have a bank pin. I suggest bringing up the subject of account safety more often in the clan chat. Promote having a bank pin and the auth on their account + a 2 step security on their connected email. Also advice to change the bank pin reset delay to 7 days, this can be done by talking to a banker. Everyone should protect their account, take the annoyance of having a bank pin over the chance of losing all your items. Never use the same password for your email as your account. Make passwords as random as possible. 8+ digits with numbers/letters/caps (if possible signs) variations. Our website is posted on the 1st page (1st post) of the clan directory! 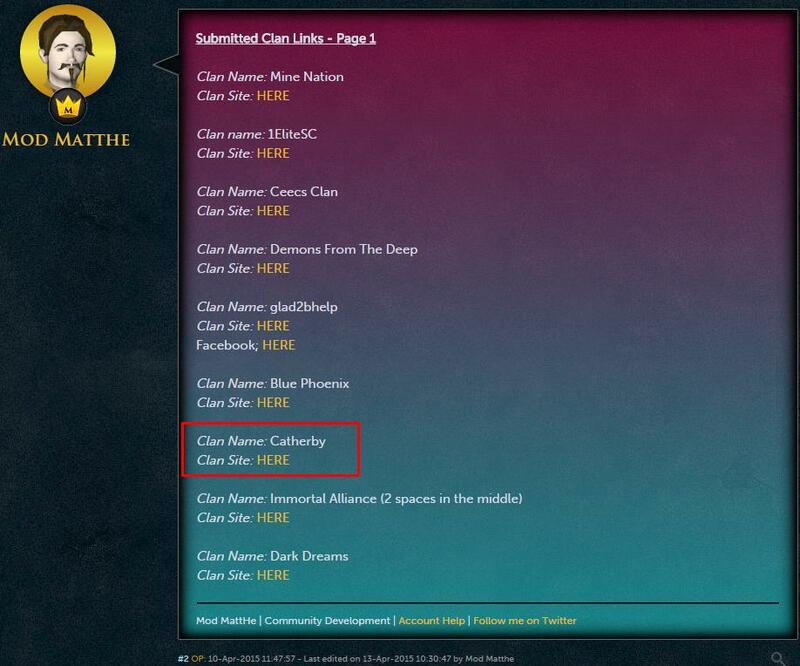 Now if someone wonders what our clan website is and you do not wish to say the url in game! Then be free to refer to this pinned thread. "Home > Forums > Clan Central > Clan Directory"
Double XP Weekend XP Gains. This thread can be used to show off much xp you have gained during the 2014 Double XP Weekend. The scores of everyone that participated in the clan cup! Also thank you Airalsuir for helping out and creating a sheet for the scores! 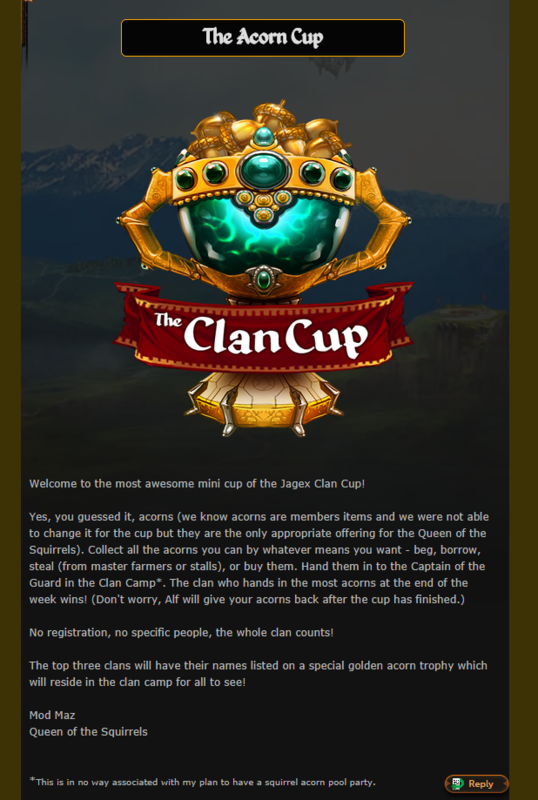 Thank you all for participating in the clan cup! Can't wait till next year! Overall Skilling Clan Cup Result: Rank 14 out of 131! !